The blood stage of the plasmodium parasite life cycle is responsible for the clinical symptoms of malaria. Epidemiological studies have identified coincidental malarial endemicity and multiple red blood cell (RBC) disorders. Many RBC disorders result from mutations in genes encoding cytoskeletal proteins and these are associated with increased protection against malarial infections. However the mechanisms underpinning these genetic, host responses remain obscure. We have performed an N-ethyl-N-nitrosourea (ENU) mutagenesis screen and have identified a novel dominant (haploinsufficient) mutation in the Ank-1 gene (Ank1MRI23420) of mice displaying hereditary spherocytosis (HS). Female mice, heterozygous for the Ank-1 mutation showed increased survival to infection by Plasmodium chabaudi adami DS with a concomitant 30% decrease in parasitemia compared to wild-type, isogenic mice (wt). 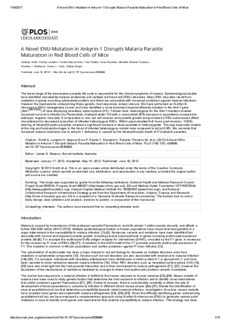 A comparative in vivo red cell invasion and parasite growth assay showed a RBC-autonomous effect characterised by decreased proportion of infected heterozygous RBCs. Within approximately 6-8 hours post-invasion, TUNEL staining of intraerythrocytic parasites, showed a significant increase in dead parasites in heterozygotes. This was especially notable at the ring and trophozoite stages in the blood of infected heterozygous mutant mice compared to wt (p<0.05). We conclude that increased malaria resistance due to ankyrin-1 deficiency is caused by the intraerythrocytic death of P. chabaudi parasites.